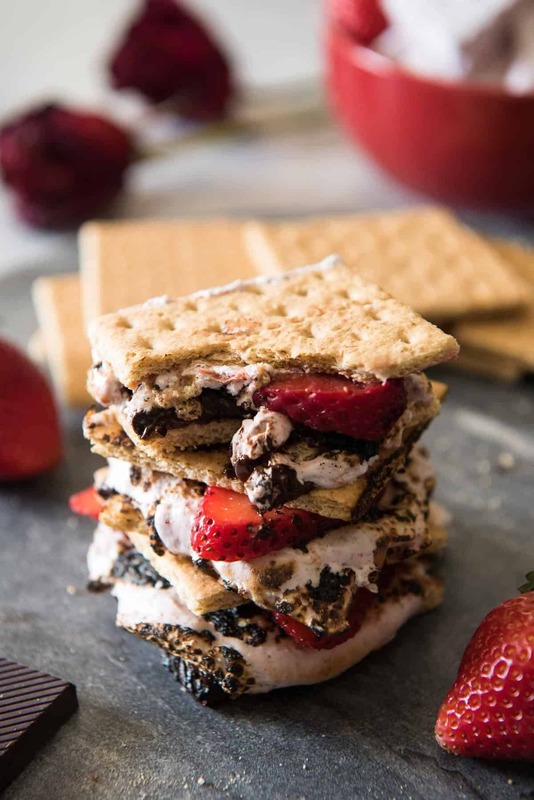 Strawberry S’mores – because winter s’mores are totally a thing! 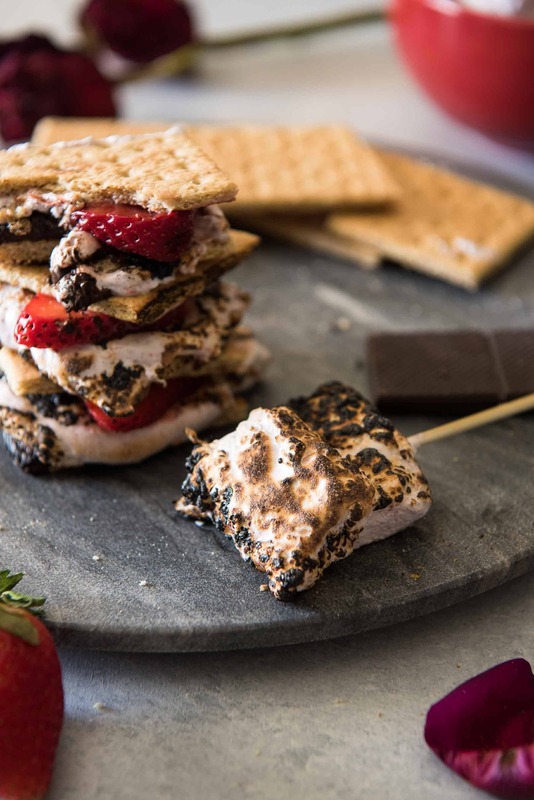 Take these classic treats up a notch by replacing the store-bought standard with homemade strawberry marshmallows, made from dehydrated Florida strawberries! I remember my first camping trip like it was yesterday. It’s a bit fuzzy, but the important parts are still there. The dampness of the St. Johns River, cooling our skin from the heat of the summer sun. The feel of the mud squishing under my toes as I dug mussels out of the shallows. The crackle and pop of the campfire as it warmed our shiny foil-wrapped dinner, the flames licking at it as if to eat it all up first. And the smell. The smell above all – above the stench of Florida marshland, that intoxicating, musky scent of pine and fire filling my nose and brain with ancient caveman wonder, instilling within me what is now a fascination with flame. Then dashing all of it to the ground with one bite of a hot, oozy s’more, bringing me back to my 9-year old reality. I was a fairly basic kid. This should come as no surprise considering I’m relatively basic as an adult. However, I know how to mix it up as an adult – something I would never have done back in the day. Basic meaning blue box mac & cheese, steak sauce on my well done sirloin, and sweet iced tea. I never branched out; I had no interest in trying different things, or different ways to enjoy my food. Embracing what it means to be a food blogger and recipe developer has been a pretty easy road, but it’s really all thanks to The Hubs. If it weren’t for him, I’d still have no idea how delicious mushrooms, avocado, and venison are. I credit Pinterest for exposing me to the food bloggers I look up to now, and draw creative inspiration from. So, being basic, my s’mores have always been made with purely store-bought stuff. I never would have thought to make my own marshmallows, much less infuse them with dehydrated strawberries. Matter of fact, dehydrating strawberries was never on my radar either (I’m more of the “can this package make it home with any berries left in it” kind of gal.) At least not until last Christmas, when my best friend gave me a big bag of homemade dried fruit in my stocking. I can’t say I’m really the trail mix type. I mean, if it’s the nut and candy kind, sure. I’ll even go for dried cranberries. But I’ve never bought a bag of banana chips or dried mango just because. That said, I was kind of unenthused about the idea; but knowing how much she loves her dehydrator, I indulged her and sampled what was inside. And before I knew it, my whole bag was gone. Turns out dehydrating your own fruit tastes wayyyyy more amazing than anything on the shelf. But let’s talk about the strawberries for a sec. 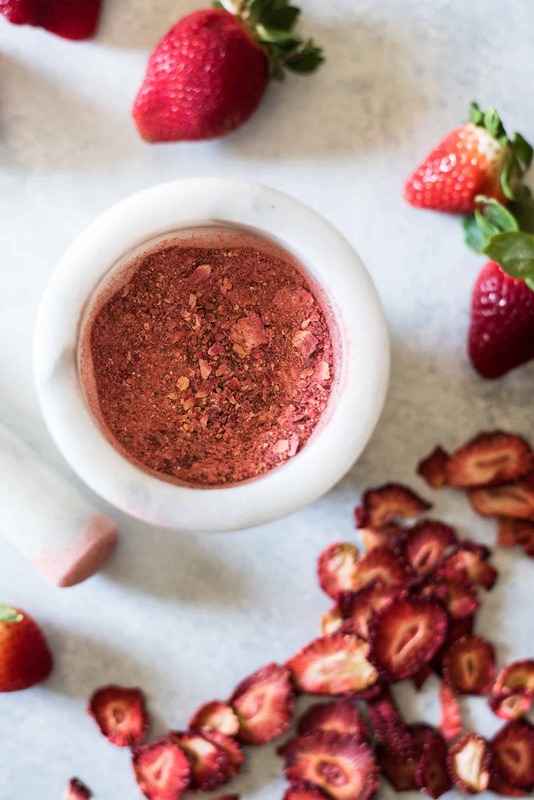 If you’ve ever thought about stocking up and preserving your Florida strawberries for all your summer and fall recipes, now is definitely the time! Even if you can’t slap on some sunscreen and a big floppy hat to make it out to one of our farms, your local grocery store should have plenty of those beauties ready and willing to be frozen, dried, canned, and even pickled! I freeze my berries all the time, since I like to stock up when they go on sale and can’t always devour the whole pint. They’re my favorite smoothie ingredient, and they also thaw beautifully when I get a craving for strawberry cheesecake. As much as I enjoy frozen, dehydrating may be my new go to method of preservation. There are so many ways to use the dried berries! 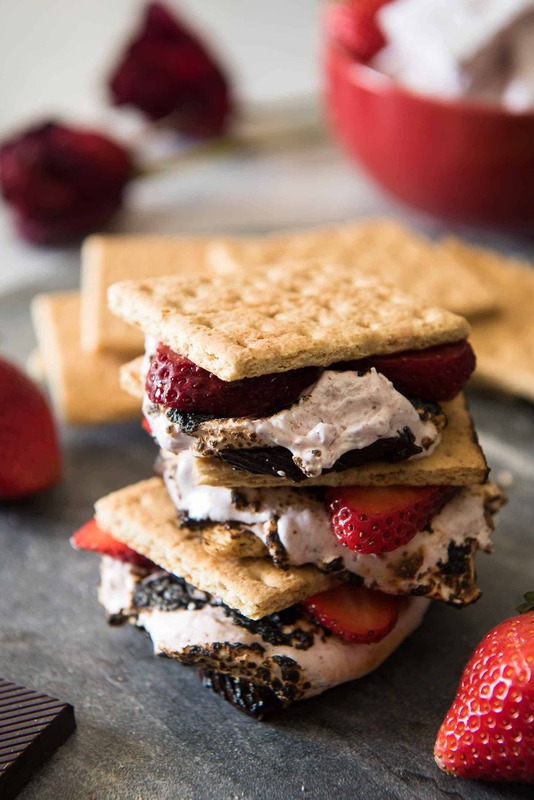 From strawberry mousse to a mix in for your morning oatmeal to these s’mores with homemade strawberry marshmallows – I could keep going, but then Google would be out of a job. Or, you could just eat them. All of them. Dried strawberries are so beautifully sweet! A decent dehydrator is relatively inexpensive, and is what I would recommend if you plan to go this route. They take anywhere from 7-36 hours to dry completely, depending on how thick you slice them or if you’re drying them whole, but you don’t have to babysit them – just let the machine do its thing, and you’ll be scarfing down all the fruits (PUNS!) of your labor in no time at all. Oven drying is also an option, but can take 18+ hours to finish. Plus it ties up the oven and heats up your house, and if you live in Florida, you know the air conditioners down here don’t need any extra encouragement! Until next winter, my pretties! I promise to enjoy you frozen and dried until then! 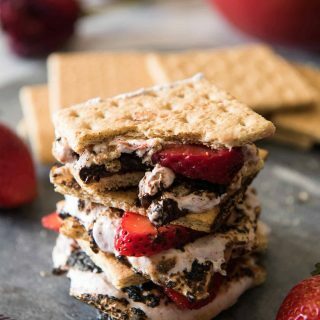 Strawberry S'mores - because winter s'mores are totally a thing! 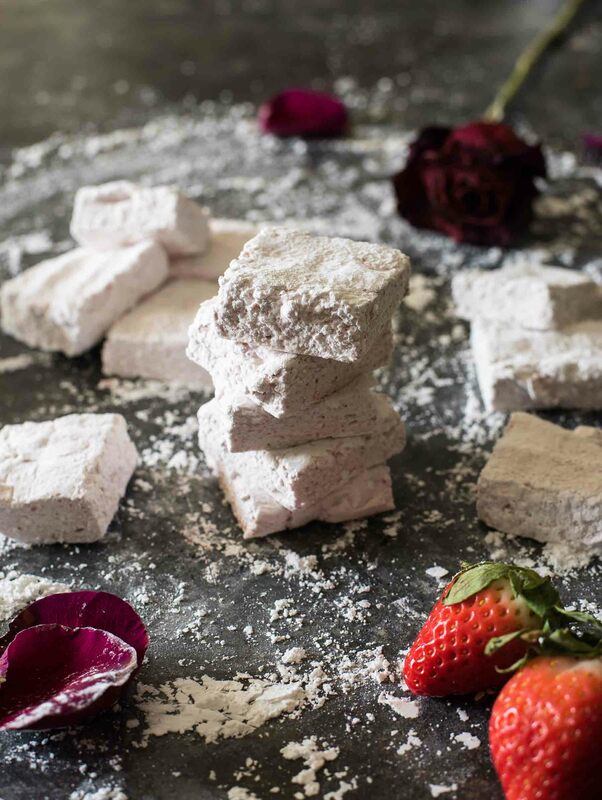 Take these classic treats up a notch by replacing the store-bought standard with homemade strawberry marshmallows, made from dehydrated Florida strawberries! 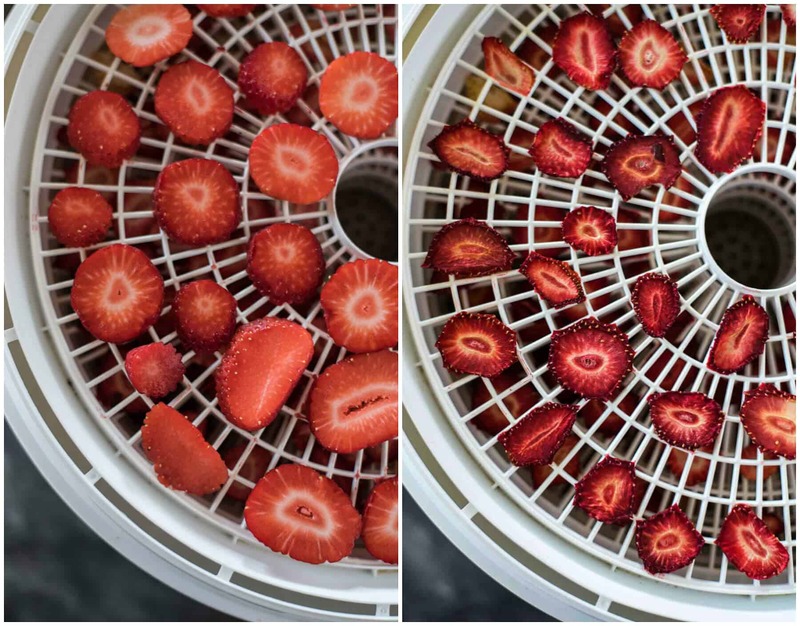 Line your dehydrator trays with strawberry slices, cover, turn on, and allow to dry for 7-12 hours until no moisture remains, and they are completely dry to the touch. Turn off the dehydrator and open it; allow the strawberries cool for 20 to 30 minutes. When you break one of the berries in half, there should be no visible moisture along the surface of the break. Store dried berries whole in a mason jar until ready for use. Using a mortar & pestle or food processor, pulverize the 3/4 cup dried berries into a powder and keep near your mixer. Whisk the cornstarch and powdered sugar together. Line an 8x8 pan with aluminum foil, spray with oil, and coat liberally with half of the cornstarch mixture. Place the egg white and ¼ cup water in a metal bowl. Sprinkle the gelatin evenly over the surface and let bloom for 5 minutes, not stirring. Set the bowl in a larger bowl filled with 2 inches of hot tap water until the gelatin is melted and no longer opaque. Combine remaining water, sugar, corn syrup, and salt in a small saucepan, but do not stir. Cover and bring the mixture to a simmer over medium heat. Simmer for about 5 minutes or until the sugar is dissolved. Remove lid and continue to simmer without stirring until the mixture reaches soft ball stage, or when a candy thermometer registers 240° F.
Move melted gelatin to the bowl of a stand mixer and attach the whisk. When the syrup is at temperature, turn the mixer on high and start drizzling the syrup down the inside of the bowl in a thin, continuous stream. Continue to beat on high for 8 to 10 minutes until the mixture is thick and stiff and has a slightly dull gloss, and the bowl has cooled. Pour the strawberry powder into the bowl and fold into the marshmallow mixtures. Use a rubber spatula to transfer the mixture into the prepared pan and spread it in an even layer. Dust the top of the marshmallow and your hands with some of the sugar-cornstarch mixture to help with the stickiness. Let set uncovered for 3-24 hours. Dust a cutting board liberally with some of the sugar-cornstarch mixture. Transfer the marshmallow slab to the cutting board. Cut into cubes and toss with the remaining starch/sugar, shaking them gently in a mesh strainer to remove excess starch. Allow to dry at room temperature, then store in a sealed container. Finished marshmallows will keep for weeks if properly stored. 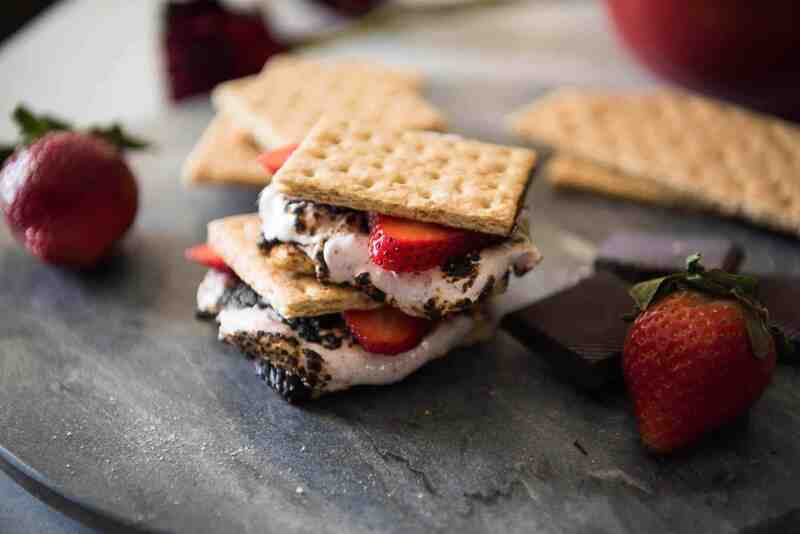 Use your favorite chocolate and graham crackers, and slices of fresh strawberries to build your s'mores! Toast the marshmallows over a campfire or the stove, or place the composed s'more in the microwave or toaster oven to melt. Strawberry Marshmallow recipe adapted from Food52. 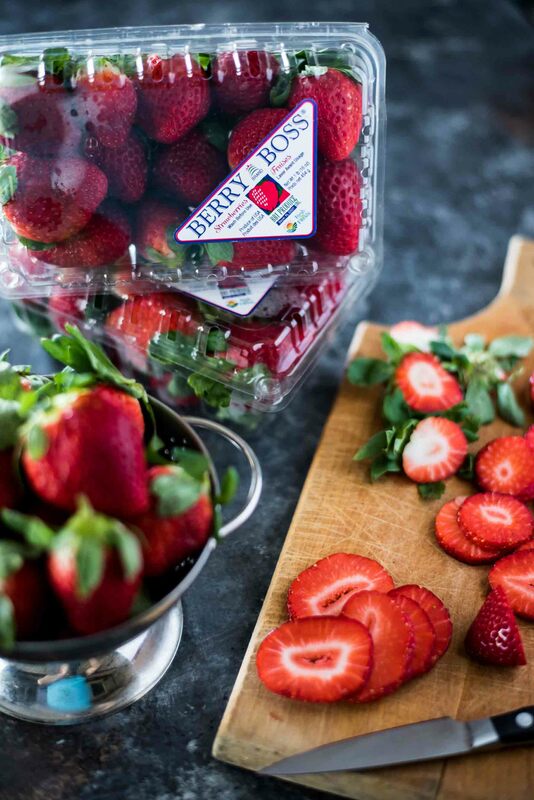 How will your preserve your Fresh From Florida strawberries? 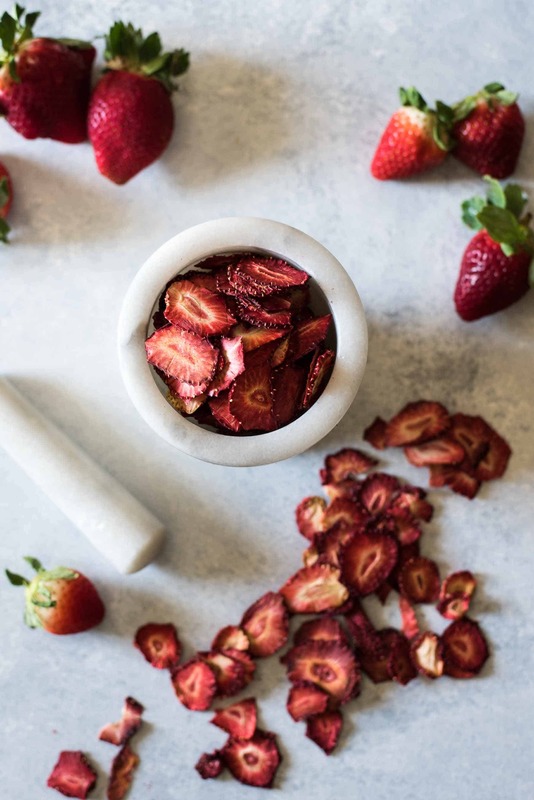 Keep up with the delicious world of Florida Strawberries by following them on Facebook, Twitter, Instagram, Google+, subscribe on YouTube, or share their recipes on Pinterest! Take a gander at these beautiful recipes highlighting our pride and joy Florida strawberries! Oh my word. These look amazing!! I have not dehydrated strawberries or made homemade marshmallows. I will definitely have to do both. I am SO into these s’mores! And I wish that wintertime strawberries were abundant in North Texas because HOLY COW, I could eat all of these! And preserve them! And make dried strawberries! Seriously. We love strawberries in this house, so I don’t doubt these would be a hit. If macaroni and cheese from a box is basic then I’m as basic as they come :). LOVING these fabulous s’mores. Strawberries make everything better! I never made my own marshmallows, time to fix that! Thanks for a recipe!